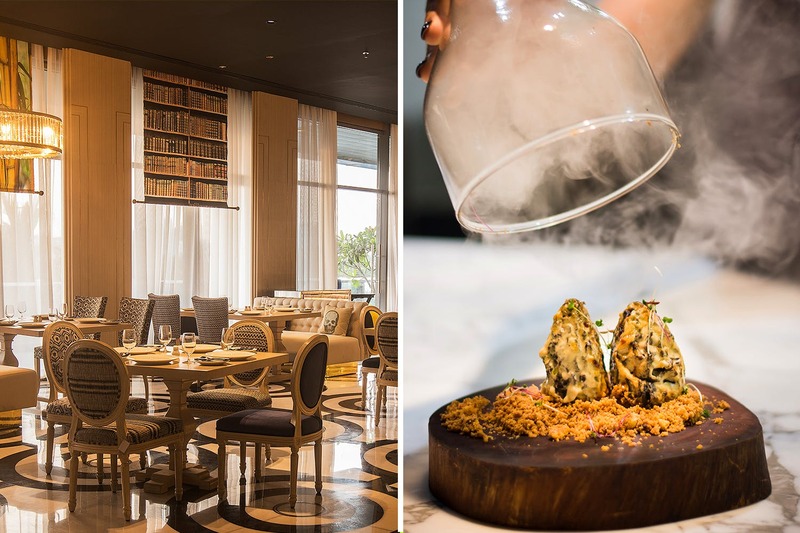 One of the finest and most unique restaurants in Mumbai, Arth is opening its doors in Pune at The Westin, Koregaon Park on June 9, and we got the first look. Did it manage to impress us? Read on to find out! Arth, in its truest sense, is a seamless combination of imaginative, experimental food and luxurious ambience. The exuberant decor by Gauri Khan is simply breathtaking – 7,000-square-feet interiors tastefully conceptualised with marble inlay flooring with monochrome motifs, subtle color play of beige, white and pastels, large windows with soft sheer drapes, flaming glass lamps, vintage stag heads mounted on the wall, dramatic crystal chandeliers and tall strong columns stacked with classic hard bound books. We also noticed the quaint little photo op space, Rex Cinema which is for people who love all things grand and retro. Despite the plush appearance, Arth is an exceptionally unique concept in itself. One of the elements to prove that is their gas-free kitchen that advocates the idea of traditional Indian cooking with sigri, chulha, copper utensils and more. In fact, Executive Chef Amninder Sandhu believes in an ‘ingredient forward’ cooking technique and ensures every item that goes in to her creation is organic and homegrown. We hear some of the key ingredients are sourced from places like Majuli, Shillong, Khonoma, Alleppey, Mangalore, Guntur, Rishikesh and Kashmir. The slow-cooking, old-school methods have phenomenal results on the dishes. The flavours are heightened and have a hint of earthy tone, the textures look richer than ever, and the taste couldn’t have gotten any better. We loved the Naga mushroom gilawat, a dish made of locally sourced mushrooms, cooked and presented on crisp saffron biscuit. If you are a seafood person, must try the Kovalam lobster taco, made of king lobsters slow-cooked in coconut, cumin and coriander masala, in an uttapam shell. For mains, we specifically loved the raan biryani, which we hear, was cooked for four long hours with goat leg and fragrant Basmati rice. Our meal ended with the dessert of the hour – kaali gaajar ka halwai, topped creamy malai. The bar menu by mixologist Jeet Rana is an assortment of exotic cocktails. We highly recommend you try the Himalayan Madhpey, a combination of gin with bitter aperitif and turmeric oleo sacchrarum.